It’s not so much where you live, but how you live. This is the message of John and Cheryl Ellsworth, who took an incredible 10-year journey around the world, visiting more than 60 different countries. If you’ve ever dreamt of doing the same, there are a few things you should know. John tells us their story. T.E. 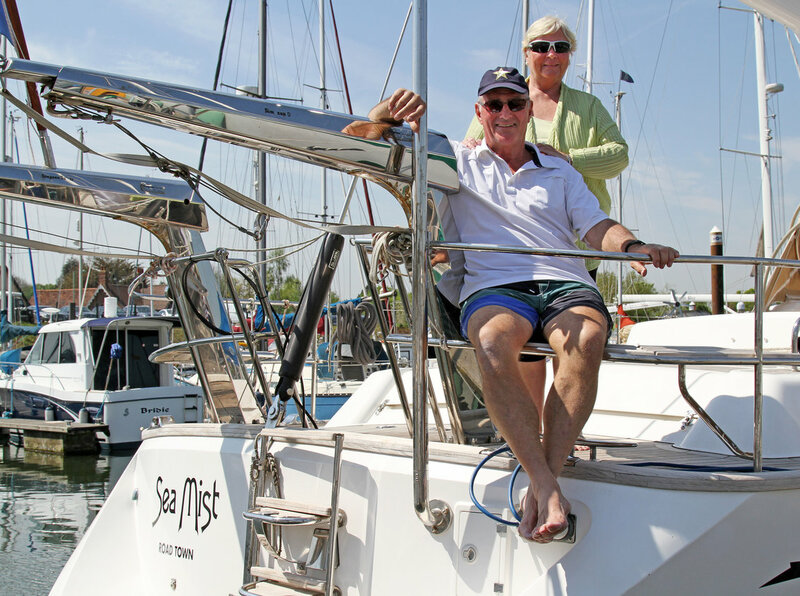 Wealth: What’s the story behind the name of your boat, ‘Sea Mist’? John Ellsworth: Cheryl, the creative one in our duo, came up with the idea of a “Magical Mystery Tour.” I leaned towards more practical names that could be easily understood in radio communications, which are necessary when plying foreign waters and entering ports to undergo the immigration, customs, health quarantine and harbour entry. This meant names with two to three syllables were preferable. And it meant finding a name that was relatively easy to spell phonetically and could be understood by non-English-speaking parties over the radio. So, we ended up with Sea Mist. We then did various searches to see if we could find any instances around the world of that name, and found none! So there we were, with a name that passed official scrutiny in the registration process with British Virgin Island Authorities as we registered Sea Mist under the BVI flag. Surprisingly, many Anglophones we encountered did not recognize the word ‘mist’….I guess they had never experienced the likes of Bay of Fundy fog. TEW: What inspired you to take this journey, and why did you choose the destinations that you did? JE: In my 30s, with a two-year-old and second baby on the way, I went into full-time studies at McGill earning a B Eng and MBA. This designation supported my journey through management consulting into executive management in major global companies with, of course, an abundance of travel around the world. Fortunately, Cheryl was able to accompany me on some of those distant trips and together we became increasingly interested in the foreign countries and cultures to which we were exposed. That appetite for travel, but without the usual related hassles and relatively short durations on location, led us to think of retirement as an opportunity to see far-off lands at a leisurely pace. We liked the idea of not having to go through airports and hotels, or having to make it back to a home that would require our ongoing attention. The move to the sailing life was driven by these desires and parameters. We did not specifically list a set of destinations or rush to circumnavigate the globe, but rather chose to set out upon a 10-year experience in the sailing life. In that life, we let our journey be dictated by positive and interesting experiences, while not ignoring the proven seasons and routes established by those who know how and when to cross the oceans. So, if we liked the people and location in a specific country or region, we might stay for months or more than a year. If we found a place unappealing, we might move on within days or hours. In this way, our voyage to more than 60 countries around the world unwound. TEW: What kind of financial preparations did you have to make before leaving? JE: We sold our home in New Jersey extremely quickly in a strong seller’s market in 2002, which was three years ahead of my retirement. That move freed up funds for the sailboat. We moved from a 7-bedroom/7-bathroom home to a 1-bedroom/1-bathroom apartment, which forced us to reduce our footprint immensely in terms of possessions. We then proceeded to search out potential blue water sailboats and selected an Oyster 56 as our new floating home in 2003. We moved all of our retirement income into fixed income annuities so there would be no distractions brought on by paying attention to financial markets and cycles in economies of the world. We left our tax filings in the careful hands of our long-serving financial advisors at T.E. Wealth. We sold all land possessions – home, furnishings, automobiles, etc. – and shipped what we wanted for the sailing life via container from New Jersey to Ipswich, England, where we’d had Sea Mist built to coincide with the timing of our retirement. From there, we sailed off into the wild blue yonder in September 2005. TEW: How did you stay in touch with friends and family? JE: Staying in touch was not really difficult. We had SSB/HAM radio service and Iridium satellite phone service that enabled access to real-time weather forecasts, voice, email, and internet. We also had a powerful cellular antenna that enabled cellular phone service as far from land as 15 nautical miles (25-30 kms). When closer to civilization, we would use shore-based internet cafés and services, and we could often acquire reasonably low-cost local cellular calling plans that enabled voice, internet, Skype, etc. In the early years, we sometimes had difficulty getting satisfactory data transmission speeds, but in the latter half of our years, we had good transmission data plans giving us access to global networks. We were regularly updating our blog, which gave friends and family the opportunity to keep up to date with our happenings, even as we spent up to a couple of weeks crossing the open waters of the Atlantic and Pacific. TEW: What did you miss most about land living? JE: We didn’t “miss” the life on land; better to say that our personalities do not ever lead us to “miss” a former era. Our nature has always led us to look forward and engage in the present and plan for the future… not to focus on former aspects of life or yearning for earlier experiences. We tried to keep in touch with important life-long relationships while, at the same time, deeply engaging in building new friendships and sailing community relationships with fellow blue water sailors. That being said, we did find that some activities, like provisioning (finding food and other consumables, as well as needed boat parts etc. ), were drastically more difficult and time-consuming. To go for groceries, we would need to launch our dinghy and find a place on shore to moor it for the day. Then, find a rental car via word-of-mouth recommendations and drive a fair distance – sometimes to multiple locations – to find what we wanted to buy. After the car would be loaded up, we would head back to our dinghy on the shore and carry everything from the car to the dinghy then from the dinghy to Sea Mist, often transiting through rough waters. Then there was off-loading the dinghy to the deck of Sea Mist, hoisting it into the cradle on the stern of our yacht, and then getting all of the goods down below to the storage areas. It’s a huge difference from life on land where grocery shopping is a walk in the park. TEW: Did you ever come close to throwing in the towel? JE: Never! We jointly conceived of and committed to a 10-year plan for immersing ourselves in the sailing life and never looked back. The community of fellow sailors is perhaps the richest part of the experience. You build treasured relationships that carry on well beyond your sailing proximities and even beyond the sailing life as you return to land. We never once thought of quitting the sailing life. Just re-evaluating our plans as to where in the world we would wander next. TEW: Did it cost less or more than what you thought? JE: Operating costs over the 11 years were about as expected with the exception of major, unanticipated, currency differentials. The largest annual costs were related to yacht insurance and private health insurance. In the early years, when we were voyaging in European waters, the costs were the highest in terms of day-to-day provisioning and the purchase of diesel fuel. For reference, we paid over 1.60 euro per litre at a time when the euro/USD rate was in the 1.50 – 1.60 range. Those were expensive years! And it seemed that we managed to pick the most expensive times to be in other countries. An example would be our timing in Australia in 2011/12, when the Aussie dollar was trading at close to US$1.10. Our first “break” came during our last three years in Southeast Asia when the Malaysian ringgit, Thai baht, and other currencies in that region (Laos, Vietnam, China, Myanmar) were historically weak, bringing living costs down considerably. TEW: How did you plan to reintegrate into the non-boating life? JE: We’d learned from others’ experiences in the yachting market that selling could very well take two years, so our original 10-year plan had included the period to market the yacht and complete the sale. As the end came nearer, exiting Sea Mist was a much bigger focus than our actual plan for subsequent life on land. Our yacht was our most valuable asset and we needed to plan for where and when to sell her, and decide on what specific refit to do in order to maximize marketability and proceeds from the sale. At the same time, we were very much enjoying life in Southeast Asia, and the pleasure of taking in the features of that region led us to extend our sailing life to 11 years before putting Sea Mist up for sale. We thought it would be more like 13 years before the sale would be realized, and we would have the funds in hand to start a land-based life. Those couple of years would give us lots of time to evaluate our options, such as geography and accommodations. We knew that we had flexibility to get through the couple of years as I jointly owned, with my three sisters, a log home on the Bay of Fundy in New Brunswick where we could relocate after moving off Sea Mist. The surprise, when we sailed back into Ipswich Harbour in England in May of 2016, was to be fortunate to have sold Sea Mist to a new owner within a couple of weeks of our arrival. We arrived back in Canada with enough funds in hand to find a new home, as well as a comfortable temporary residence to stay in while searching for something permanent. Due to our age, and the associated dependence on health care in our later years, we knew that Canada would be our permanent home. But where? After viewing some 25 waterfront homes in the Saint John to St. Stephen areas of New Brunswick, we decided to build a new home on some land that my father had given to me back in 1975 – immediately next door to the house I grew up in. Cheryl did not have the same connections to this vicinity but both of us had come to be very attracted to ocean views and access to the shore. Additionally, she’d had many years to think about and conceive of the home she believed could be built so as to create an environment which we could both enjoy, and would be welcoming to family and friends. The house is well underway and we expect to move in this November. TEW: How did this lifestyle change impact your long-term finances? JE: There wasn’t much long-term financial impact on our day-to-day finances, but we were hit very hard by the global economic downturn and even more so by the substantial swings in currency differentials. We had Sea Mist built in the UK at a time when we paid over US$1.90 per pound sterling (GBP). When we sold it, the rate was approximately US$1.29/GBP, which meant we lost a third of the value of the boat just in currency differentials. To make matters worse, we sold the boat in GBP and though the transaction was supposed to close three days before the Brexit vote, due to a legitimate issue for the Australian buyer, it closed afterwards instead. The result was a reduction of over 12% in the amount of Canadian dollars realized versus the Canadian dollar value on the day of the actual sale. Those were the big hits as far as our long-term financial picture is concerned. TEW: What kind of person would like the sailing life? What kind wouldn’t like it? – attracted to language challenges in countries, and enjoy eating food that is very different from Western menus. If these things appeal to you, then maybe a sailing life is worth considering. A person who finds themselves to be the opposite of these characteristics should not consider it! TEW: What is one of your favourite memories from your trip? JE: We think of memories sort of in categories. Our best experiences underwater, with the abundance of sea life and swimming with sharks, would be in the waters of Fakarava South in the Tuamotus of French Polynesia. The warmest, friendliest people found were in the small islands of Indonesia. We will remember them for the way they welcomed us into their homes and villages, as though we were long lost friends. Perhaps the most beautiful bays (calas), beaches and hiking trails were found on the south coast of Minorca in the Spanish Balearics. The scariest memories will stay with us as we recall the ever-present dangers of crocodiles and snakes in Australia. And when it comes to food, our love of Thai food would be at the top of our list. But the truly treasured memories are of the fellow sailors, the delightful experiences and close relationships built within the sailing community. Though neither party is still sailing the oceans of the world, many of those relationships have continued today. This article was published in T.E. Wealth’s Strategies newsletter, September 2017 edition. Read the full edition here. Retirees should be happy not to qualify for GIS Is There An Opportunity in Preferred Shares?